I had the most remarkable experience the other day that I put on the back burner (so to speak) to write about once I formed a complete thought about it. Tonight I believe the thought came together. It happened as I was telling my own daughter not to listen to her parents about everything. That each person must find their own path in this world, and that YES her mom and dad are flawed and working with the set of circumstances that we came into. She looks up to us both because she feels we have good, practical jobs. She overheard her dad telling her big brother that his college choice was not realistic and that he wouldn’t be able to support a family. My heart broke a little as I heard this. I told her emphatically that just because your parents are stuck in survival mode, you don’t have to be and won’t be happy (because yes, this young lady is a dreamer in the biggest way) unless developing her talents and discovering her passions. It really hit me that these kids can do things differently. I shared with her that she doesn’t need to wait to be almost 40 to pursue her art. So, back to the remarkable experience. 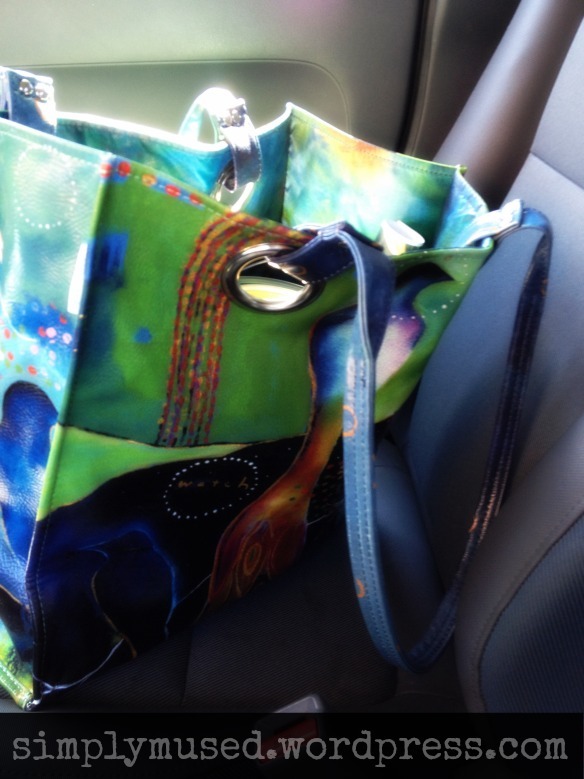 I had taken my daughters to the doctor and while one was waiting on labs etc, A young man in his early 20s complimented my Papaya tote from a beautiful Flora Bowley painting. This is pretty common because the bag is unique (I found it at my favorite home decor store and couldn’t pass it up). Once in a while when someone presses I will tell them more about her and how she is a Portland artist who teaches her intuitive painting process online. This man asked more questions and wanted to know more about her as an artist as well. He said that he is also an artist and shared his work that he shares on his personal Facebook profile. I let him know that I was also an artist and shared my artist page with him as well. We turned out to have quite a bit in common. For example, he was going to the same university that I graduated from my social work program from. He also had the “helpers” heart. He also deeply cared about the youth and felt that so many of his generation were lost and “robotic” as he put it. He said that art had literally saved his life. He had not had an easy high school experience due to losing friends to suicide. He had not even had a smooth childhood. Things had been pretty rough for him and he had struggled with his own depression. Which after telling me these very personal things, said again that he is resilient because of his love of art. He said that he works on it in every bit of free time he gets. He gives it to those he feels need a lift or to feel a part of things. I got the impression that he cares and he is sharing with an open heart. Our conversation went on for so long that my daughters started feeling restless and I could tell that they were ready to go. It really isn’t every day that I get to talk with the up-and-coming generation outside of my own children, so after meeting this remarkable young man, my heart was lighter and my hope levels raised. People can say what they will about artists all day with their perceptions of us being to airy-fairy or whatever. Creativity is hope. It is what connects the artist to their higher source. It is what becomes a symbol of a lesson or a concept understood that the artist then shares with whoever sees that art. Take Flora’s painting. It being on a bag sparks curiosity in those who see it. They must stare at it. Even comment on it. Question it. This level of mystery is a teacher. Creativity is what makes the practical possible, but that is the subject of another day. I’m also learning that those opportunities to touch peoples’ lives will present themselves even if I am not able to do as much art and writing as I’d like to right now. The universe has its own agenda. I will watch for that. This entry was posted in Uncategorized and tagged art, creativity, depression, Flora Bowley Paintings, hope, painting, resilience, self-care, youth. Bookmark the permalink. That’s a profound and personal meeting you had with that young artist. I love it how the Universe presents us with our needs. Hi, love this! Would you please provide a link for the online intuitive painting process?